Question 1. Have there been changes in forest areas where you live ? Find out what these changes are and why they have happened. Although. the number of trees in the forest has Increased, reduction of rainfall in recent years has stunted the growth of trees. The Adivasi villagers living inside the forest areas are gradually leaving their traditional occupations and migrating to the towns for education and jobs. A number of wild animals like tigers and elephants are sometimes seen on the edges of the forest. but they do not venture out for fear of being killed by human beings. Earlier the tigers used to come into the nearby villages and take away animals and small children at night. Question 2. Write a dialogue between a colonial forester Adivasi discussing the issue of hunting in the forest. Colonial Forester (CF) Who are you? What are you doing inside the fores this time? Adivasi (A) I am a villager living in XYZ village on the south edge of forest. I have come to hunt some animals for feeding my family. CF Don’t you know that we have banned the hunting of animals in forest? Go away, you cannot be allowed to hunt animals. It is illegal. A I need the flesh of the animal so that my wife can cook the food. I regularly hunt for animals and nobody has stopped me before. CF No, you will not be allowed to do this. Only Britishers are allowed to animals. Go back to your village. Otherwise, I will have you arrested. A Okay, if you say so, I will go. But I will return. Question 1. Discuss how the changes in forest management in the colonial period affected the following groups of people. European foresters regarded shifting cultivation as harmful for the forests. The government banned shifting cultivation. Shifting cultivators were forcibly displaced from their homes In the forests. Some had to change occupations, while some resisted through large and small rebellions. The forest laws deprived people of their customary rights and meant severe hardship for the nomadic and pastoralist communities. They could not cut wood for their houses, could graze their cattle or collect fruits and roots. Hunting and fishing became illegal. They were forced to steal wood. If they were caught, they were at the mercy of the forest guards and they would have to offer bribes to the guards. Many pastoralist and nomadic communities like the Korava, Karacha of the Madras Presidency lost their livelihoods. Some of the nomadic communities began to be called criminal tribes and were forced to work instead in factories, mines and plantations under government supervision. They were also recruited to work in plantations. Their wages were low and conditions of work very bad. By the early nineteenth century, oak forests in England were disappearing. This created a problem of timber supply for the Royal Navy. By the 1820s, search parties were sent to explore the forest resources in India. Trees were felled on a massive scale and large quantities of timber were being exported from India. The colonial government took over the forests and gave vast areas to European planters at cheap rates. The British Government gave many large European trading firms the sole right to trade in the forest products of particular areas. The government gave contracts to contractors who cut trees indiscriminately and made huge profits. Large areas of natural forests were also cleared to make way for tea, coffee and rubber plantations to meet Europe’s growing need for these commodities. The colonial government took over the forests, and gave vast areas to European planters at cheap rates. These areas were enclosed and cleared of forests and planted with tea or coffee. Communities like Santhals from Assam, and Oraons from Jharkhand and Gonds from Chhattisgarh were recruited to work on tea plantations. Their wages were low and conditions of work very bad. The plantation owners, under the protection and rights given by the British Government, made huge profits. In India, Shikar or hunting of tigers and other animals had been part of the culture of the court and nobility for centuries. Under colonial rule the scale of hunting increased to such an extent that various species became almost extinct. The British saw large animals as signs of a wild, primitive and savage society. They believed that by killing dangerous animals the British would civilize India. The British gave rewards for the killing of tigers, wolves and large animals on the grounds that they posed a threat cultivators. The Maharaja of Sarguja alone shot-1157 tigers and leopards upto 1957. A British Administrator George Yule 400 tigers. Over 80000 tigers, 150000 leopards and 200000 wolves Wet. killed for reward between 1875 and 1925. Initially certain areas of the forests were reserved for hunting. Question 2. What were the similarities between colonial management of the forests in Bastar and Java? Answer Forest management of Bastar in India was in the hands of the British and in Java it was in the hands of the Dutch. The Dutch, like the British, wanted timber to build ships and to make sleepers for railway tracks. Both the British and the Dutch enacted forest laws to control the forests and put restrictions on the customary rights of the local people. They were prevented from entering the forests, they could not graze cattle, or cut wood or take forest produce without permission. Both the governments banned shifting cultivation. Both the British and the Dutch introduced scientific forestry. The villagers in Bastar were allowed to stay on in the forests on the condition that they would provide free labour for the forest department in cutting and transportation of trees and protecting the forests from fire. Similarly, in Java the Dutch imposed rents on the cultivated land in the forests and then exempted some villages if they collectively provided free labour and buffaloes for cutting and transporting timber. This system was known as the ‘blandongdiensten’ system. Question 3. Between 1880 and 1920 forest cover in the Indian subcontinent declined by 9.7 million hectares, from 108.6 million hectares to 98.9 million hectares. Discuss the role of the following factors in this decline. The spread of railways from the 1850’s created a new demand. Railways were essential for colonial trade and for the movement of imperial troops. To run locomotives. Wood was needed as fuel and to lay railway lines sleepers were essential to hold the tracks together. Each mile of railway track required between 1760 and 2000 sleepers. From the 1860’s the railway network expanded rapidly. 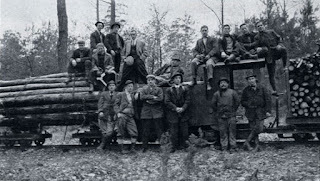 As the length of the railway tracks expanded a very large number of trees were felled. As early as the 185Os,in the Madras Presidency alone 35000 trees were cut annually for sleepers. Forests around the railway tracks started disappearing very fast. By the early 19th century, oak forests in England were disappearing. This created a problem of timber supply from the Royal Navy. English ships could not be built without a regular supply of strong and durable timber. Imperial power could not be protected without ships. Therefore by the 1820’s, search parties were sent to explore the forest resources of India. Within a decade trees were being felled on a massive scale and vast quantities of timber were being exported, leading to disappearance of forests. As population increased, the demand for food went up. Peasants extended the boundaries of cultivation by clearing forests. In the early 19th century, the colonial state thought that the forests were unproductive. They were considered to be wilderness that had to be brought under cultivation so, that the land could yield agricultural products and revenue, and enhance the income of the state. So between 1880 and 1920, cultivated are a rose by 6.7 million hectares by clearing the forests. The demand for commercial crops like jute, sugar, wheat, cotton and raw material for industries increased. Therefore the British encouraged expansion of cultivation by clearing forests, Leading to decline in forest cover. In commercial farming, natural forests which had lots of different types of trees were cut down, In their place one type of trees was planted in straight rows, This is called a plantation, To promote plantation farming or commercial farming, different varieties of trees were cut down leading to loss of many species and loss of forest cover when the trees were cut for commercial use. These areas were enclosed and cleared of forests and planted with tea or coffee. Plantations were large in area leading to loss of large forest areas. In shifting cultivation, parts of the forest area are cut and burnt In rotation. Seeds were sown in the ashes after the first monsoon rains and the crop was harvested by October-November, When fertility decreased, the process was repeated at another location. This led to a large loss of forests. Question 4. Why are forests affected by wars? Answer Forests are affected by wars because forest products are used for fulfilling various needs and requirement during war. In the case of India. 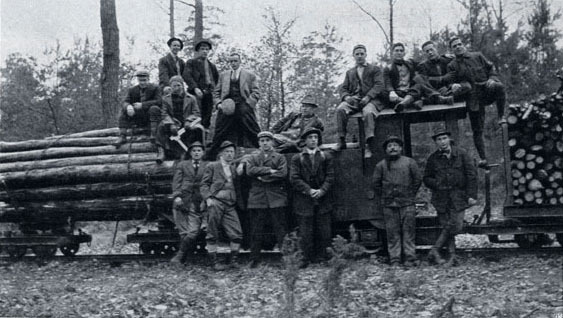 during the First World War and the Second World War the forest department’ cut trees freely to meet British war needs. During the Second World War in Java just before the Japanese occupied the region, the Dutch followed ‘a scorched Earth policy‘, destroying sawmills and burning huge piles of giant teak logs so that they did not fall into Japanese hands. The Japanese exploited the forests recklessly for their war industries forcing villagers to cut down forests, Many villagers took this opportunity expand cultivation in the forests. Thus, wars also led to destruction forests.